If you’ve traveled through Southeast Asia, you might have marveled at this tropical beauty growing on tree branches, dangling its vivid 18-inch flower panicles down like clusters of otherworldly grapes. Flower gardeners who live in USDA growing zones 10 and 11 can grow one of the 150 species of medinilla as a tender perennial outdoors, but others can grow this exotic flower as a houseplant or patio tropical. Also known as the pink lantern plant and the rose grape, Medinilla magnifica belongs to the Melastomataceae family. Medinillas bear panicles of flowers that resemble clusters of small grapes, which stand out against attractive dark green foliage. Some medinillas have showy bracts at the base of their flower clusters which resemble flower petals. Medinillas are evergreen shrubs in their native habitat, which includes Java, the Malay Peninsula, the Philippines, and Sumatra. The leaves contribute to the tropical look of this plant, growing up to 14 inches in length. Leaves are ribbed, and moderately succulent. The average size of a medinilla shrub is three to four feet, but you can keep the plant at a reasonable size by pruning it after flowering. Medinilla plants can be epiphytic in the rainforest, which means they grow on trees or shrubs instead of in the ground. In this case the medinilla uses its host for support, but doesn’t draw nutrients from or harm its host plant. Medinilla plants can also grow in well-drained soil. You can use a commercial planting medium for orchids, which resembles something like chunky bark. This allows air circulation around the roots, which prevents root diseases. An orchid pot, which contains extra ventilation holes, is also well-suited for a medinilla specimen. Medinillas appreciate acidic soil conditions, although the coral medinilla is somewhat more tolerant of alkaline conditions than other varieties. All medinillas grow best in dappled shade; direct sun will scorch the leaves or cause leaf drop. 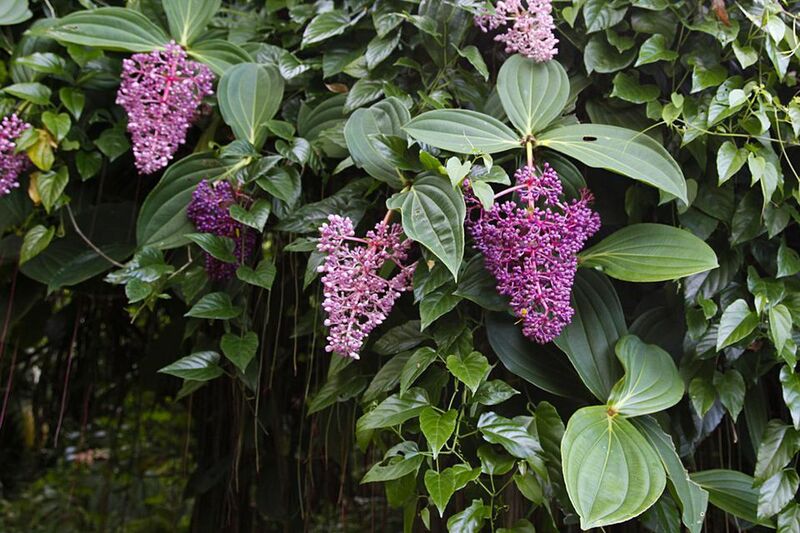 Consider the medinilla's habitat: as it grows nestled in the lower branches of large trees in the jungle, it receives dappled sunlight; you should provide similar conditions. You can grow medinilla plants as houseplants, but many find that they make better patio or greenhouse specimens due to their humidity requirements. If nothing else, giving your medinilla a summer vacation in a partially sunny spot outdoors will increase its vigor. An added bonus to medinillas growing outdoors is their appeal to birds, bees, and butterflies. Medinilla plants need above average moisture and humidity, and they don’t like drying winds. The medinilla is a light feeder, and excessive nitrogen will cause the plant to produce lush foliage at the expense of the blossoms. An occasional feeding with liquid compost will give the plants all the nutrients they need, and help keep the soil in the optimal mildly acidic pH range of 6.0. All medinilla plants bloom in the warmest months of the summer, but bloom time can vary from April through August. This doesn’t mean medinillas crave triple digit temperatures: the ideal growing temperature is 70-75 degrees F. Temperatures below 50 degrees F may cause the plant to yellow or drop its leaves. Winter temperatures between 60 and 70 degrees F simulate the natural winter dormancy of the plant, and encourage bud formation in late winter. If you grow your medinilla in a container, the quality of the potting mix will deteriorate over time. The chunky soil allows air circulation will break down and become more dense. If you notice your medinilla container staying moist more than a day after you watered it, it's time to repot with fresh soil. If you're feeling especially successful with a stocky medinilla specimen, you can attempt to strike up some cuttings to increase your tropical plant collection. Cuttings root easily in a mix of damp sphagnum moss. Take a cutting with at least two leaves, but remove 2/3 of each leaf to reduce their burden on the stem. Use a powdered rooting hormone as a stem dip to encourage rooting. Following flowering, the fruit clusters that the medinilla produces are full of seeds. In fact, one fruit cluster may produce 2000 viable seeds, and as species plants and not hybrids, the seeds will produce offspring true to its parent features. Seeds from ripe, soft fruits will be ready to grow. Crush the fruits, and you wlll see hundreds of seeds suspended in the fruit gel. Clean them in a bowl of fresh water, and change the water daily for several days to remove tannins that inhibit germination. Plant seeds on the surface of a sterile potting medium, and cover with a layer of milled sphagnum moss to prevent damping off disease. Keep moist until germination, which can take a month. Seedlings will grow about one inch a month, and may take two to three years to reach flowering size. Mealy bugs may trouble medinilla plants occasionally. If so, dab the insects with a cotton swab dipped in isopropyl alcohol. Spider mites will infest medinilla plants stressed by dry conditions, but daily misting will discourage these pests. The Medinilla genus is diverse, so look for subtle differences as you explore the more than 180 species. ‘Pink Medinilla’: Large bracts bear pink flower clusters, and eventually dark blue berries. Grows to six feet, so plant in the ground or a large patio container.